The actual level of infrasound in this figure at 1 Hz is above 90 dB. 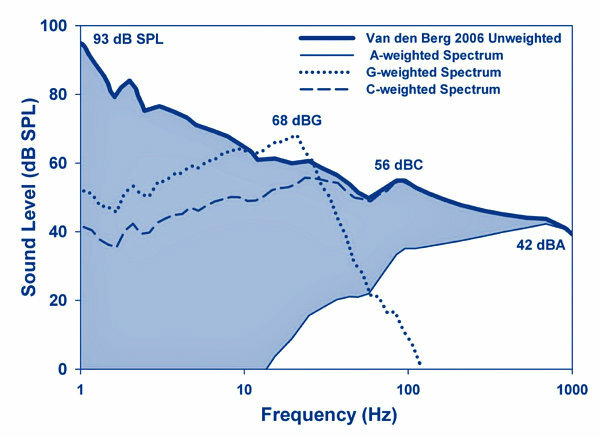 Measuring infrasound with dBG at 1 Hz gives a level of only 50 dB. Thus 40 dB is “hidden.” Forty dB is a huge amount of sound energy, which will not be heard at that level, but may be perceived. The graph also demonstrates why dBA is useless at accurately measuring below 200Hz. Measurement with dBC likewise fails to measure the true low frequency noise and infrasound level once you get below 100 Hz. » Van den Berg, G. P. (2006). The sound of high winds: The effect of atmospheric stability on wind turbine sound and microphone noise. PhD dissertation. University of Groningen, Netherlands.